This is a test instrument that has a simple transistor oscillator that will oscillate when a crystal is installed. 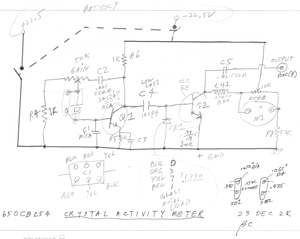 The circuit will oscillate with a broad range of crystal values. 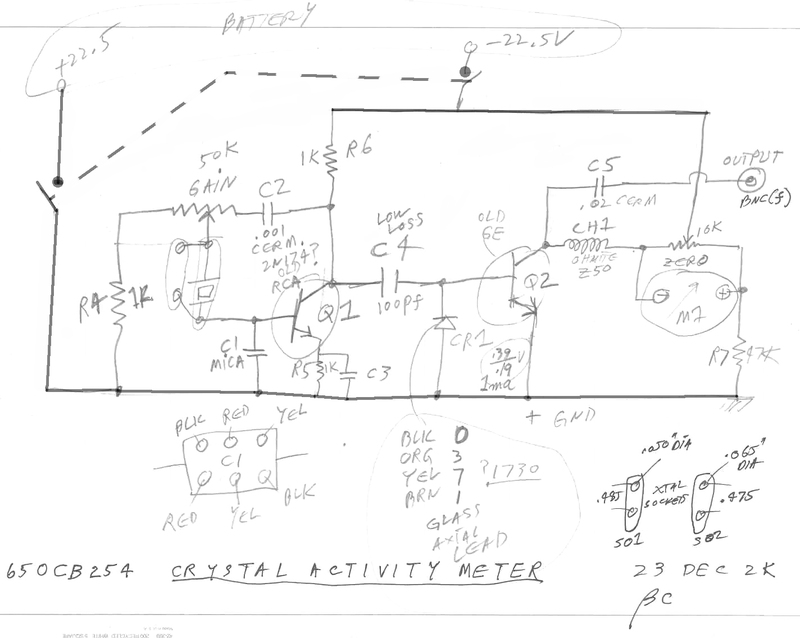 In addition to getting an indication on the meter that the crystal is working there is also an output so that a counter can tell you the crystal frequency. Crystal Impedance Meters allow you to determine the parameters of a crystal, the activity meter just tells you that the crystal is alive. The printed circuit board appears to be home made rather than made by a company. On the front panel is "650CB254" which may be a drawing number for this unit if it was made by a small company. is connected between the battery and the circuit, just turn on to use and off to save battery. I was expecting to use this control with no crystal installed to zero the meter, but it does not seem to work that way. 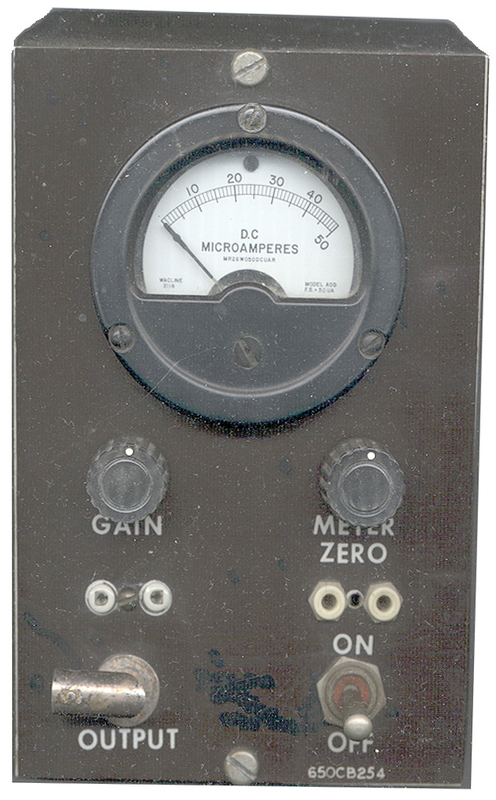 The ZERO and GAIN controls can be used to get a on scale meter indication. Once the meter is reading something then the output signal is high enough to trigger a counter. I tested a bunch of crystals in the 1 to 10 MHz range and the crystal label was within about 1 or 2 kHz of the counter reading. After working with the HP/Agilent 4395A to measure the equivalent circuit of an ICM Cat No. 453546L 5.0 xtal designed for use in a 75 deg C oven it looks like the CL of this crystal activity meter is 85.95 pF. Normally crystals expect 20 to 32 pF loads but since this is a hand wired and printed circuit test device and it has 2 crystal sockets the parasitic capactance is much higher than an application circuit. This meter showed the 1 MHz crystal in an HP 8406A Comb Generator as dead, yet the crystal equivalent circuit values look OK. The loss at the Fr peak is down 11 dB for this crystal but down only 0.7 dB for the ICM 5.0 MHz crystal. If the Crystal Impedance is too high then there is not enough gain in the crystal impedance meter to start oscillation. The gain is probably some function of frequency. Testing a Color Burst crystal shows the CL of the meter to be 76.43 pF. This crystal has 1.7 dB loss at the Fr peak F osc = 3.585315527 MHz. 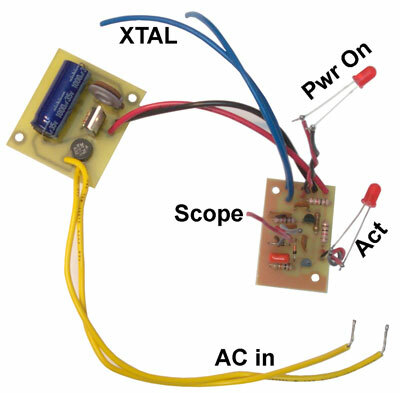 This unit uses early PNP transistors and requires a 22.5 volt battery. The original battery was a military BA-261/U that was about the same size as a modern 9 volt battery. The original battery was soldered into the unit and was attached to the case using white RTV. If you have any information about this unit would you let me know? Power Supply and Crystal Tester PCBs available from FAR Circuits. The Activity LED gets brighter for an oscillating crystal and the scope output allows either a scope or counter to be used. But if a counter is used the load capacity of this tester needs to be trimmed. To minimize heat in the voltage regulator the input voltage should be just a little above 7 Vrms.